The short sight radius and long double action pull of the small .380 Autos make accuracy a challenge. 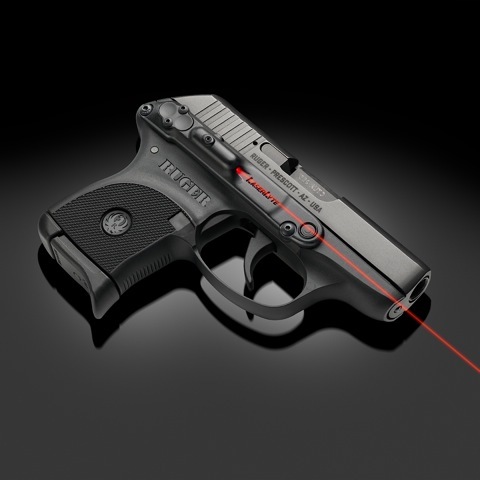 I am excited about the LaserLyte Side Mount laser made for the Kel-Tec P3AT and Ruger LCP. There is no doubt a laser helps to put shots on target. This is even more advantageous for small guns that might be used for self-preservation. Lasers are great for shooting when you can not or do not have time to get a traditional sight picture. My wife, Amy, feels more comfortable having a concealed carry firearm with a laser to aim in a self-defense situation. I believe in iron sights and lasers are not a replacement. However, lasers are a great sighting aid and enhance the accuracy making your concealed carry gun more lethal. Lasers are not new to the market but the side mount is a new product from LaserLyte. There are three big and important reasons why I believe you should use this type of great product. First, the side mount system is priced under $100. I have been frustrated that the firearms industry has not produced more affordable laser option. Second, the laser is small and light enough that it does not impact the firearm, except, perhaps your accuracy. There are amazing specifications for this product. Since the laser is just .380 inches high and incredibly light at .25 oz., I use the same holster. There is almost no weight added to my fly weight .380 auto. The third reason I believe this is a great product: The LaserLyte is a trifecta – it works great, it is easy to use, and it is reliable. Did I mention the easy installation? I had this on my gun and working in less than 10 minutes. No need to worry about battery drain. There is an auto-off function to prevent battery drain and you can choose between pulse or constant on mode. This entry was posted in Concealed Carry, Tactical Gear and tagged concealed carry, kel-tec, laser, laserlyte, pocket gun, pocket pistol, ruger, side mount laser system. Bookmark the permalink.